Guardhouse Tetra coin holders are a great storage solution for your individual coins. Our plastic 2x2 snaplock cases contain a black EVA foam interior to hold your coin in place and provide a great background to let your coin shine against. Guardhouse 2x2 coin holders are made from sturdy acrylic plastic and fit perfectly in Guardhouse Tetra display boxes and white Tetra storage boxes. Guardhouse Tetra 2x2 snaplocks are packed 10 each in an attractive retail display. Fits Large Dollars. Guardhouse Tetra coin holders are a great storage solution for your individual coins. Our plastic 2x2 snaplock cases contain a black EVA foam interior to hold your coin in place and provide a great background to let your coin shine against. Guardhouse 2x2 coin holders are made from sturdy acrylic plastic and fit perfectly in Guardhouse Tetra display boxes and white Tetra storage boxes. Guardhouse Tetra 2x2 snaplocks are packed 10 each in an attractive retail display. Fits small dollars. Guardhouse Tetra coin holders are a great storage solution for your individual coins. Our plastic 2x2 snaplock cases contain a black EVA foam interior to hold your coin in place and provide a great background to let your coin shine against. Guardhouse 2x2 coin holders are made from sturdy acrylic plastic and fit perfectly in Guardhouse Tetra display boxes and white Tetra storage boxes. Guardhouse Tetra 2x2 snaplocks are packed 10 each in an attractive retail display. Fits 1/10th oz Gold Eagle. Guardhouse Tetra coin holders are a great storage solution for your individual coins. Our plastic 2x2 snaplock cases contain a black EVA foam interior to hold your coin in place and provide a great background to let your coin shine against. Guardhouse 2x2 coin holders are made from sturdy acrylic plastic and fit perfectly in Guardhouse Tetra display boxes and white Tetra storage boxes. Guardhouse Tetra 2x2 snaplocks are packed 10 each in an attractive retail display. Fits 1/4 oz AGE. Guardhouse Tetra coin holders are a great storage solution for your individual coins. Our plastic 2x2 snaplock cases contain a black EVA foam interior to hold your coin in place and provide a great background to let your coin shine against. Guardhouse 2x2 coin holders are made from sturdy acrylic plastic and fit perfectly in Guardhouse Tetra display boxes and white Tetra storage boxes. Guardhouse Tetra 2x2 snaplocks are packed 10 each in an attractive retail display. Fits 1/2 oz AGE. 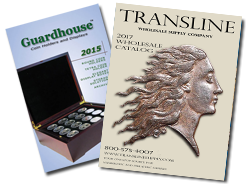 Guardhouse Tetra coin holders are a great storage solution for your individual coins. Our plastic 2x2 snaplock cases contain a black EVA foam interior to hold your coin in place and provide a great background to let your coin shine against. Guardhouse 2x2 coin holders are made from sturdy acrylic plastic and fit perfectly in Guardhouse Tetra display boxes and white Tetra storage boxes. Guardhouse Tetra 2x2 snaplocks are packed 10 each in an attractive retail display. Fits 1 oz. AGE. Guardhouse Tetra coin holders are a great storage solution for your individual coins. Our plastic 2x2 snaplock cases contain a black EVA foam interior to hold your coin in place and provide a great background to let your coin shine against. Guardhouse 2x2 coin holders are made from sturdy acrylic plastic and fit perfectly in Guardhouse Tetra display boxes and white Tetra storage boxes. Guardhouse Tetra 2x2 snaplocks are packed 10 each in an attractive retail display. Fits 20 dollar gold. Guardhouse Tetra coin holders are a great storage solution for your individual coins. Our plastic 2x2 snaplock cases contain a black EVA foam interior to hold your coin in place and provide a great background to let your coin shine against. Guardhouse 2x2 coin holders are made from sturdy acrylic plastic and fit perfectly in Guardhouse Tetra display boxes and white Tetra storage boxes. Guardhouse Tetra 2x2 snaplocks are packed 10 each in an attractive retail display. Fits Cent/Penny. Guardhouse Tetra coin holders are a great storage solution for your individual coins. Our plastic 2x2 snaplock cases contain a black EVA foam interior to hold your coin in place and provide a great background to let your coin shine against. Guardhouse 2x2 coin holders are made from sturdy acrylic plastic and fit perfectly in Guardhouse Tetra display boxes and white Tetra storage boxes. Guardhouse Tetra 2x2 snaplocks are packed 25 per pack. Fits nickels. Guardhouse Tetra coin holders are a great storage solution for your individual coins. Our plastic 2x2 snaplock cases contain a black EVA foam interior to hold your coin in place and provide a great background to let your coin shine against. Guardhouse 2x2 coin holders are made from sturdy acrylic plastic and fit perfectly in Guardhouse Tetra display boxes and white Tetra storage boxes. Guardhouse Tetra 2x2 snaplocks are packed 25 per pack. Fits Dimes & $2..50 Gold. Guardhouse Tetra coin holders are a great storage solution for your individual coins. Our plastic 2x2 snaplock cases contain a black EVA foam interior to hold your coin in place and provide a great background to let your coin shine against. Guardhouse 2x2 coin holders are made from sturdy acrylic plastic and fit perfectly in Guardhouse Tetra display boxes and white Tetra storage boxes. Guardhouse Tetra 2x2 snaplocks are packed 25 per pack. Fits Quarters. Guardhouse Tetra coin holders are a great storage solution for your individual coins. Our plastic 2x2 snaplock cases contain a black EVA foam interior to hold your coin in place and provide a great background to let your coin shine against. Guardhouse 2x2 coin holders are made from sturdy acrylic plastic and fit perfectly in Guardhouse Tetra display boxes and white Tetra storage boxes. Guardhouse Tetra 2x2 snaplocks are packed 25 per pack. Fits Hlaf Dollars. Guardhouse Tetra coin holders are a great storage solution for your individual coins. Our plastic 2x2 snaplock cases contain a black EVA foam interior to hold your coin in place and provide a great background to let your coin shine against. Guardhouse 2x2 coin holders are made from sturdy acrylic plastic and fit perfectly in Guardhouse Tetra display boxes and white Tetra storage boxes. Guardhouse Tetra 2x2 snaplocks are packed 25 per pack. Fits Large Dollars. Guardhouse Tetra coin holders are a great storage solution for your individual coins. Our plastic 2x2 snaplock cases contain a black EVA foam interior to hold your coin in place and provide a great background to let your coin shine against. Guardhouse 2x2 coin holders are made from sturdy acrylic plastic and fit perfectly in Guardhouse Tetra display boxes and white Tetra storage boxes. Guardhouse Tetra 2x2 snaplocks are packed 25 per pack.